Have you ever wondered if your link building efforts are being wasted? I have. I wonder about it all the time. It is often difficult to put a value on your link building efforts or to even gauge the success of your link building team. Because of this difficulty, we have created a link building efficiency tool to help guide our efforts so we can yield the greatest possible Return on Investment (ROI) for our clients. The answer is simple, you can not tell how efficient you are at link building if you are not tracking pertinent metrics. As SEOs we are often far more focused on setting up our link building strategy then we are on optimizing it. Unfortunately, we rarely track the efficiency and profitability of our efforts once we (or, our teams) have begun. What Metrics Does Our Tool Measure? 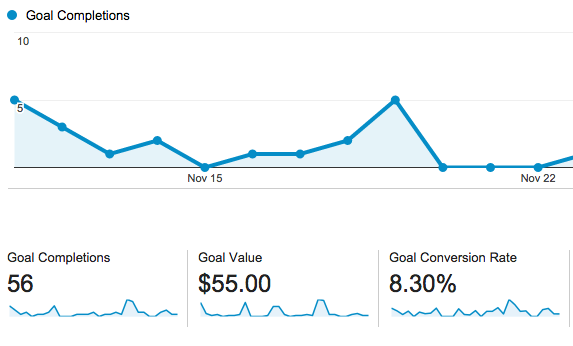 For tracking Referral Traffic, Conversion Rate, and Average Lifetime Value of Conversion, we utilize Google Analytics. If you need help setting this up please see here. First, download the link building efficiency tool here. There are detailed instructions for each column in the comment section of each category header, but I will explain the tool in further detail below. Upon opening the tool in Excel, you will see a table in the top left corner with the following information: “Company Name”, “Average Lifetime Value of Conversion”, and “Domain Authority Multiplier”. You should customize this information to fit your unique situation. Next, you will simply insert the URL of the link you are trying to build. In the section titled “Backlink URL”. For this column, we utilize a drop down menu which allows you to simply choose whether your link is “Live” or “Awaiting Approval”. If you choose “Awaiting Approval” an “Overall Value” will not be calculated; but instead, show “Sorry Still Waiting”. For this section, we also utilize of drop down menu. From this menu, you can choose from the following categories: “Guest Posting”, “Content Promoters”, “Giveaways”, “Commenting”, “Directories”, “Topical Blogs”, “Links Pages”, “Reviews”, “Donations”, “Forums”, and “Professional Organizations”. These categories are derived from Citation Labs. 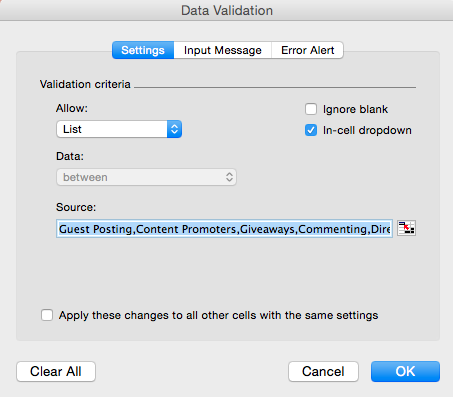 *tip: If you would like to change these categories, you can highlight the cell you want to change, click on “Data”, click on “Validation”, edit, and click “OK”. 5. How Long Did it Take You? This part is essential for your ROI calculation. *tip: If you have multiple members of your team building links you can track their name and use a Vlookup to calculate their hourly rate. Here, we simply use the MozBar to quickly gather any metrics we want to track. For the sake of simplicity, we only track the DA of the website we are trying to earn the link from. You do not need to touch this column. The Domain Authority Value will be calculated by multiplying your Domain Authority*Domain Authority Multiplier. The Destination URL can either be your Homepage or any specific product pages, landing pages, etc. *tip: Make sure you are setting up your goal tracking funnel so you can track conversions and any leaks in your funnel. You will also need to have at least one Goal Value set up so you can determine the “Overall Value” of your link building efforts. How much traffic did your link generate. While not all link building efforts serve the purpose of generating traffic, I would argue that the most valuable link building campaigns generate some sort of referral traffic. Quite simply, how many of the visitors from your link building efforts are converting and what is that rate? You do not touch this column. The value for each cell is calculated via the initial table in the top left corner in cell B2. You do not touch this column. The “Overall Value” calculation is determined by the following formula: =IF(B:B=”Live”,(I7*J7*K7)+G7-(D7*E7),”Sorry Still Waiting”) which simply means, if the link is live it’s value is determined by: (Referral Traffic Generated * Conversion Rate * Average Lifetime Value of Conversion) + Domain Authority Value – (Time Required * Hourly Rate). 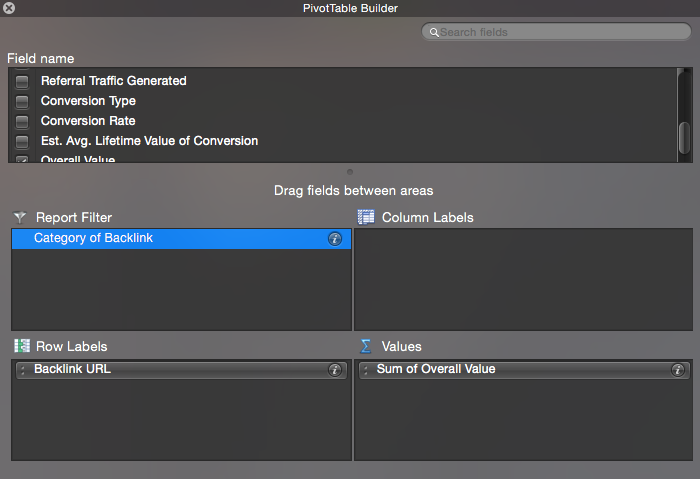 Does Your Tool Use a Pivot Table? You can set your pivot table up however you like, but we have attached a screenshot below of one of our favorite ways to analyze our link building efforts. We hope this tool can be of use for you and that it will at least make us SEO’s think more critically about the efficiency and profitability of our link building. While the tool is not overly specific, especially in regards to conversion tracking, it is meant to provide actionable insight while maintaining practicality. We are always open to improving the tool and would love to hear your thoughts in the comments below.